Junk King Sacramento has been dedicated to an eco-friendly way of disposing things ever since they began collecting junk over 12 years ago. They have great partnerships with many recycling facilities throughout the area. They also work closely with charities who accept furnishings, clothing and household goods. Nothing goes to waste when Junk King Sacramento is on the job. Most customers find that sorting through all their stuff is what takes up the most time. But that is time certainly well spent consider the final result. Just keep in mind that you don’t have to move around any of those piles you create. Just leave everything where you find it in Junk King will pick it up even if it means going from room to room. No pile of junk is too big, too small or too dirty for Junk King Sacramento to get rid of. Are you ready to get rid of your clutter? 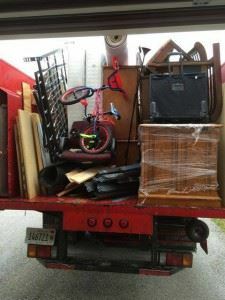 This entry was posted in sacramento junk removal and tagged Junk King, junk removal, reviews on September 26, 2017 by Junk King. Last updated September 26, 2017 .